Biology relates to all living things, from microorganisms right up to the largest mammals and trees. It is about ‘us’, so holds relevance to anyone studying the subject, at any age. On entry to the Senior School in Year 7, girls are taught by a specialist teacher, learning about Cells, Human Reproduction, Classification and the Skeleton. A basic understanding of biological techniques such as using a microscope are developed and confidence in working in a laboratory environment is built. Through Year 8 and 9 we are keen for girls to pursue their interests in the subject through the study of topics as diverse as Photosynthesis, Food and Nutrition and Inheritance. Assessments become more in line with those that they will meet at GCSE but we always look for girls to go beyond the boundaries of the syllabus to explore their own biological passions. As girls enter their GCSE programmes they become confident in biological processes and have a good grounding in all of the areas covered at this level. The current GCSE courses offered are either the AQA GCSE Combined Science Trilogy Course leading to two GCSEs or the individual sciences via the AQA GCSE Triple Award, leading to three separate GCSEs in Physics, Chemistry and Biology. Material and skills learnt in Years 7 to 9 are expanded and challenged at GCSE Level, while still offering the opportunity to uncover something new and enriching. Biology offers a challenging course of study that holds relevance with much seen in everyday life and current affairs, as well as linking with many other subjects. It is a popular subject throughout the phases of the school and, as a department, we seek to take this interest and foster its development, whether that is into A level study or simply for the enjoyment of learning. • Atoms, Bonding and Moles, Chemical Reactions and Energy Changes, Rates, Equilibrium and Organic Chemistry, Analysis and the Earth’s Resources. Computing during Key Stage 3 covers a wide range of topics. Coding skills, alongside the computation thinking required to understand, design and test solutions, are developed from simple visual programming platforms such as Scratch to high-level programming languages such as Python. Girls also learning about e-safety, as well as other key computing areas such as web design, handling images and sound and the use of application development tools. Girls are also given the opportunity to design and build increasingly complex electronic circuits; from simple Arudino-based games in Year 7 to sensor-controlled robots in Year 9. At Key Stage 4, GCSE Computing is offered as an option that builds on the experiences of the Key Stage 3 programme. Software design and programming skills continue to be developed alongside key theoretical topics such as network design, databases and the Internet. Other issues, such as open-source software, system reliability and electronics are explored using a wide range of online and practical resources. Mathematics in the Senior School moves on from the numeracy and basic geometry topics covered in Key Stages 1 and 2 to extend and broaden the range of skills and knowledge required to solve increasingly complex problems. Algebra provides a powerful tool for investigating patterns and solving problems and graphs are used to represent mathematical relationships. Geometry topics introduce new methods and concepts to solve a wide range of shape, area and volume problems and statistical methods are applied to interpret and represent data using measures and diagrams. Throughout, problem-solving is a central theme; by developing fluency in key mathematical skills and through the use of logic and reasoning, our girls become increasingly able to solve a range of mathematical problems with confidence. Throughout Key Stages 3 and 4, lessons are taught in ability groups, providing more support in smaller classes where this is needed while allowing others to move more quickly onto enrichment and extension activities where this is more appropriate. For all, support outside lessons is regularly provided in the form of clinics and Sixth form subject mentors. In Key Stage 4, we follow the Edexcel GCSE in Mathematics and, during Year 11, some girls take the opportunity to study GCSE Statistics or the AQA Level 2 Certificate in Further Mathematics. In the Sixth form, A Level Mathematics is consistently one of the most popular subject choices. We follow the OCR (MEI) GCE in Mathematics, which combines both pure and applied mathematical topics. A Level Further Mathematics is also offered as a full subject and additional support for girls taking AEA or STEP examinations is also available. Physics is a fascinating subject that attempts to help us understand how the world around us works. 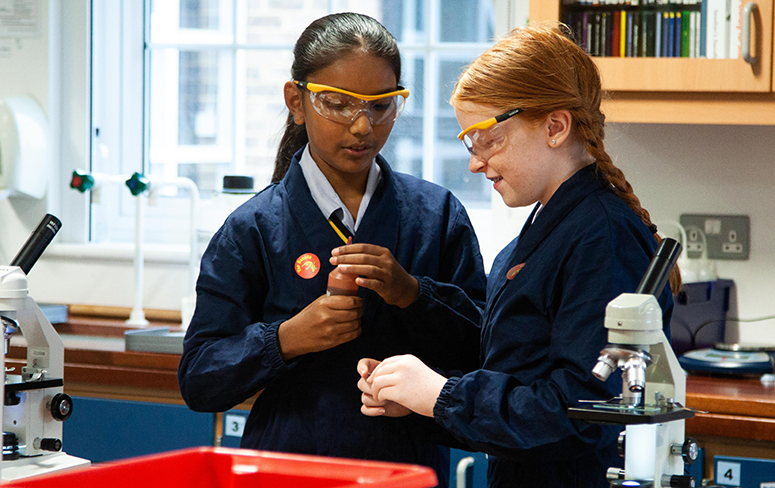 Physics in the Senior School starts with a broad and balanced curriculum allowing the girls to develop a love and understanding of some of the fundamental ideas before we then go on to stretch and challenge them throughout their Key Stage 3, GCSE and A Level courses. At Key Stage 3, the girls are introduced to a variety of topics including Forces, Energy, Electricity, Waves and The Earth and Beyond. With the basics now in place, the girls can approach their GCSE courses confident in the knowledge that they have a solid base on which to build. These current courses offered are either the AQA GCSE Combined Science: Trilogy Course leading to two GCSEs or the individual sciences via the AQA GCSE Triple Award, leading to three separate GCSEs in Physics, Chemistry and Biology. These courses build on the knowledge already established and also introduce new topics such as Fields, Thermal Physics, Lenses and Radiation. 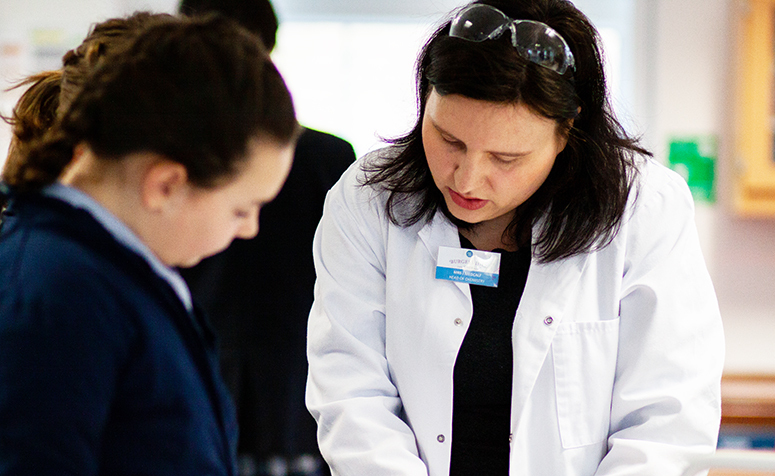 A Level Physics is a popular course; we currently follow the AQA examination board. With the A Level course comes a whole new branch of Physics, stretching and building on the Mechanics of GCSE but also introducing new topics such as Particle Physics, Atomic Physics and Relativity. There is definitely no stereotyping at Burgess Hill Girls, Physics is definitely not ‘just for the boys’ and each and every girl is encouraged to think for themselves, analyse a situation and make valid, well-informed decisions. Physics often calls for imagination and inventiveness and at Burgess Hill Girls we actively encourage the girls to ask those awkward questions.